Finally. Another of 100 Drawings. I’m not dead, just slammed. Big projects, lots of painting, and some exciting new secret crap I can’t divulge just yet. Even this drawing is for an upcoming show. The show is entitled “Get the Lead Out” at Echo Echo Gallery in Seattle and opens Friday, September 9th. Ominous Burden: graphite on paper. Number 34 of 100 Drawings. For purchase inquiries, please contact Ally Takeuchi. I’ve finished a new painting for another upcoming pop culture show at G1988: LA, this time paying tribute to Garbage Pail Kids. For those that didn’t grow up in the 80s, the Garbage Pail Kids were an awesome collection of illustrated trading cards/stickers made by Topps, created as a blatant mockery of the super popular insipid Cabbage Patch Kids. The cards were all illustrations of twisted, gross and cutely disturbing pudgy characters meant to show a dark side of the Cabbage Patch Kids. 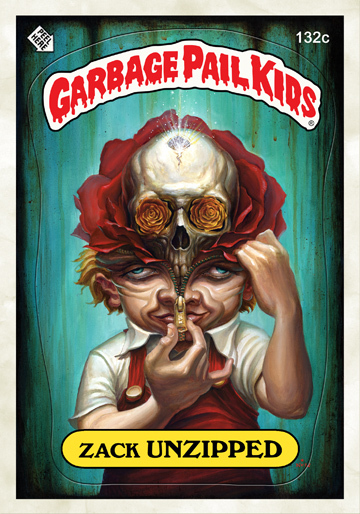 I was a ridiculously HUGE fan of these, and remember spending many dollars at both the corner 7/11 and the local ice cream truck on each magical pack of five GPK cards. I can still taste the inedible “gum” each pack came with, which on more than one occasion actually shattered a tooth upon chewing. The old joke was to collect the gum and chew up the cards, as it was probably much healthier for you. As I finished up my painting, I was struck by the surreal nature of the experience. I grew up the aforementioned HUGE fan and remember drooling over the amazing art, crazy characters and awesome sense of humour in this collectible art set. To be making a painting of one of the cards for a show actually sponsored by the company that made the original cards is just mind blowing at times. I never imagined as a kid, running after the ice cream truck to buy a pack of stickers featuring gross characters, that one day I’d be painting one of my own.